I have tried to reassign the channel numbers to get it to match the order in the manual, but not sure I was doing it right. Could this be the issue? 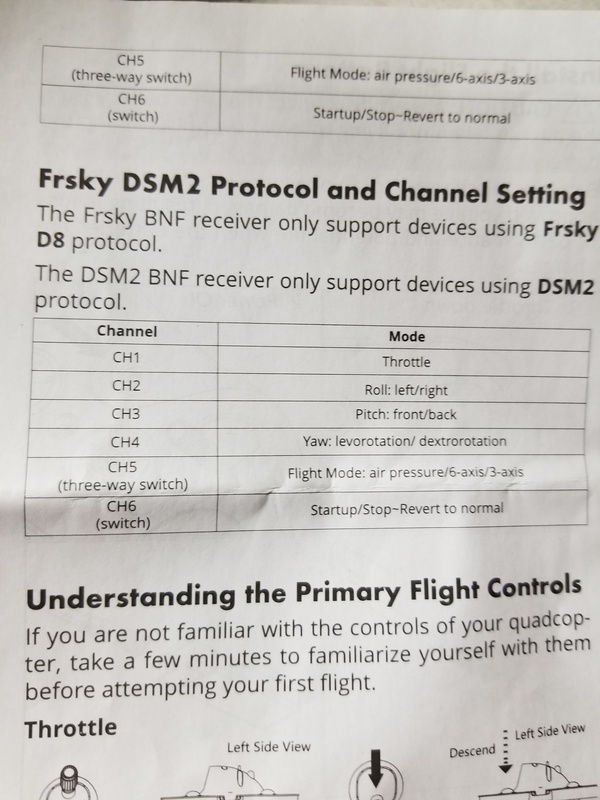 The default channel order for Frsky is AETR, while DSM is TAER. From the pic it looks like they don't adjust the channel assignments based on the protocol. You have the right idea to change the assigments in the tx. 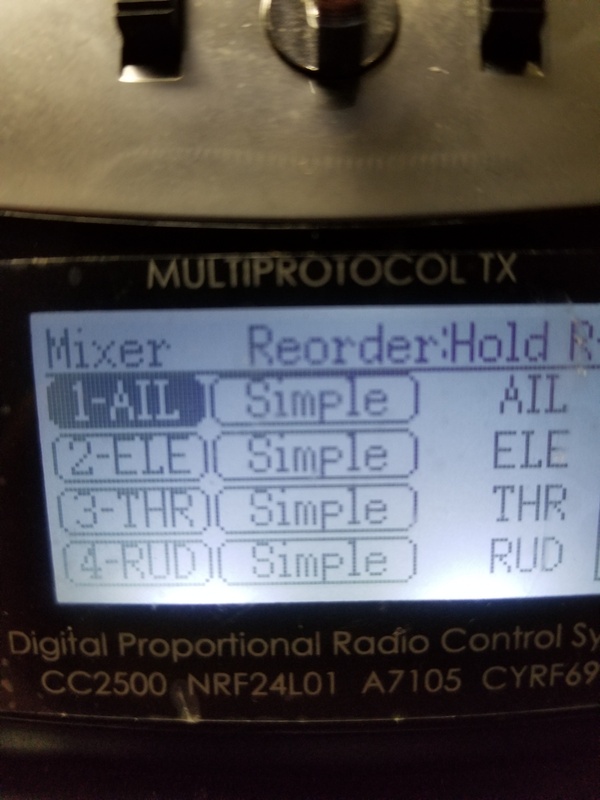 In the mixer for channel one change the SRC to THR, channel 2 AIL, and channel 3 to ELE. The labels in the left column on the mixer page are determined by protocol and can't be changed. When I reorder them that way, it just assigns throttle to my pitch stick on the right. I've also tried messing with the scale +/- and subtrim for the throttle, although I'm not entirely sure which way to go with which settings to be sure end points are low enough. Still no go tho... Any ideas are appreciated. Swanjp26 wrote: When I reorder them that way, it just assigns throttle to my pitch stick on the right. So that channel order isn't correct. Just need to figure out the correct order. How do you know the throttle is working? Props shouldn't spin if not armed. Also should have asked if you use mode 2. Since you mentioned right pitch stick I'd guess it is. In mode 2 the right vertical stick is the ELE source. With the assignments mentioned ELE was source for channel 3. And moving the right vertical stick caused the throttle to react? That indicates throttle is controlled by channel 3 (matching the default Frsky channel order). Assign source THR to channel 3. Then need to figure out what channels control pitch, roll, and yaw. Maybe with throttle control you can arm and use prop response to figure that out. The common channel orders with throttle on channel 3 are AETR and EATR. Seems like AETR should be right for an Frsky receiver.